Create your own Knitted American Flag! The 4th of July is coming up and we wanted to give you a cute project to help celebrate our wonderful country! 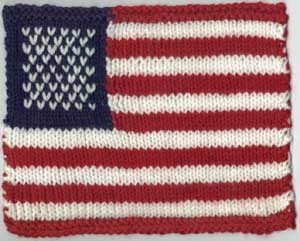 We found a great pattern of an American Flag at Knitting on the Net. Enjoy your homemade American Flag to help make this holiday a little more festive. This pattern from Dori Johnson will give you a fun activity to do for the holiday!